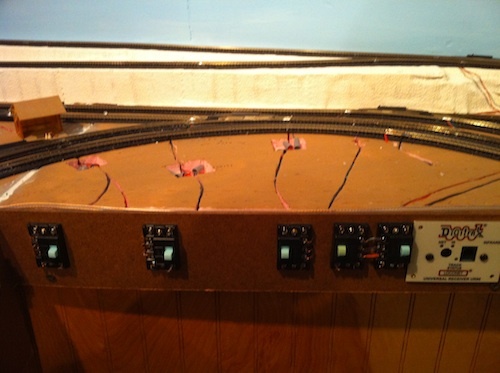 Layout wiring for a large model railroad can be a very complicated and time-consuming issue. Using DCC to power your track makes it a little easier, but if you use infrared or radio control for walkaround throttles or if you have a large enough layout that requires power districts with circuit breakers, it gets more intense. Then if you add lights to your structures and other special effects like fire and welding scenes, automated features, remote-controlled turnouts, signals, etc., the layout wiring becomes very extensive and sometimes a little overwhelming to the non-electricians among us. The shear number of wires involved in a large model railroad containing all these exciting features can be quite daunting when you begin the process. The main thing to keep in mind when starting this project is that it’s actually easy to hook up one wire at a time. It may take a while to get all the wires that you need hooked up, but it’s definitely doable and very satisfying in the end when your visitors come over and see what you’ve done. You do have to be in the mindset of enjoying the process and try not to be impatient about the amount of time required to do it right. Managing all this layout wiring is part of that process that should not go unheeded. It’s extremely important as you go along to keep your wiring neat and professional looking. This will not only add to your personal satisfaction with the job you’ve done, but it will also make life much easier when (not if) you have to troubleshoot later. Don’t ask me how I know this. Most of us have a plywood base and the wires from the track and from accessories are threaded down through holes drilled in the base to the underside of the layout. 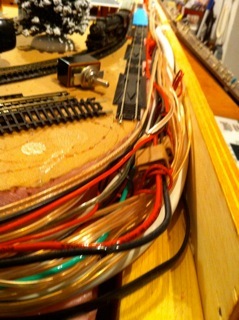 A lot of the work associated with train layout wiring therefore involves stooping, bending or crawling under the layout. If you have to spend many hours doing this, it tends to be rather backbreaking work. 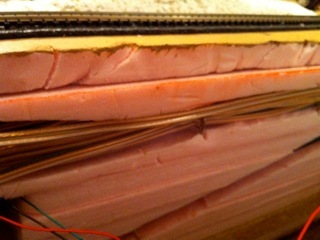 By using several layers of extruded foam on top of plywood as a base, I can now run all of my track, turnout and accessory wires to the front of the layout, rather than to the bottom. Now I can just sit on a stool in front of the layout and do all the wiring from there. I use my Tippi foam cutter to make grooves in the front of the foam base and on the surface of the unfinished layout to “house” and manage the wires. When I’m finished with all the wiring for one section, I just replace the hardboard fascia for that section. If I need to get to the wiring later to add an accessory wire or track feeder, I can remove the fascia, work with the wiring in the front of the layout section and then replace the fascia again. To make some sections of the hardboard fascia easily removable, I have placed hinges on the bottom of the fascia and Velcro on the top so that I can easily just pull down a section of the fascia when I need to work on wiring and then put it back up when I’m done. As you can see from the pictures this keeps all the layout wiring fairly neat. You can easily see what goes to what in most cases. You could also label some of the wires if it’s not already evident where they go. My track buses (12 gauge) are red and black, and my accessory buses (14 gauge) are green and white, and remote turnout wires are clear, so it’s impossible to get them mixed up. Try to have as much fun with this part of the hobby as you do with the other parts. The end result will amaze your friends and yourself as well that you had the wherewithal, fortitude and patience to do it! From "Layout Wiring Management" to "The Blue Ridge and Southern"
From "Layout Wiring Management" to "Homepage"